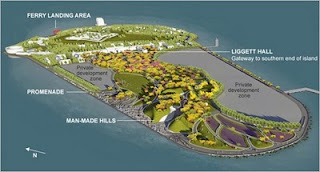 If you haven't discovered Governors Island yet, you have still another reason to procrastinate for a couple of years. The newest plans for this Manhattan satellite island, now owned by the City of New York, include manmade hills, a ferry landing, a waterside promenade, and a bevy of hammocks slung from oaks and birch trees, all with great city views. The photo, courtesy of West 8; Rogers Marvel Architects; Diller Scofidio & Renfro; Mathews Nielsen and Urban Design, shows two private development zones that haven't yet been spoken for. 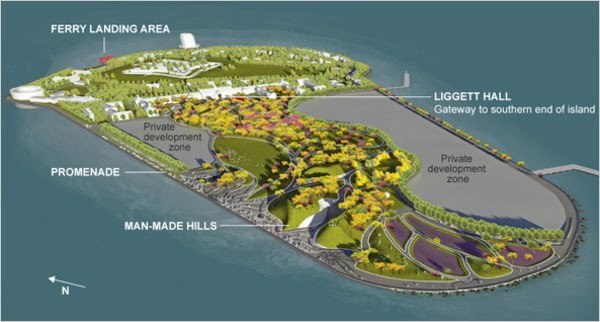 Happily, there appears to be considered thought being given to how the development will evolve, with tidal basins, marshes, fragrant green plantings and other eco-considerate elements part of the larger plan. Thus far, Governors Island's been great for concerts, biking and escaping to an island off an island. I can't wait for the next incarnation of this former Coast Guard headquarters.